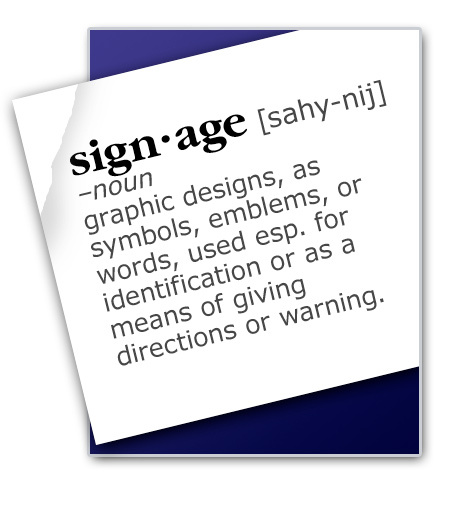 A extensive list of the most common signage terms and materials. Alumacorr: Rigid material made with corrugated plastic sandwiched between two sheets of aluminum, perfect for outdoor displays. May last for years and ready to accept vinyl graphics and direct printing. Aluminum: Lightweight, durable, non-tarnishing all-purpose metal material capable of being cut, formed, shaped and painted. Great for both interior and exterior applications. 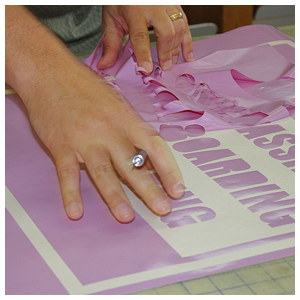 Acrylic: Sign-grade sheets excellent for outdoor translucent signs, normally 3/16" in thickness for regular applications. Corex: Corrugated plastic, lightweight, readily available in a variety of colors for inexpensive signs and displays. Coroplast: Trademarked brand name of corex distributed worldwide. Foamcore: A foam-centered material covered on both sides with a slick white paper, great for interior printed and point of purchase displays. Gatorboard: A rigid foam-centered material covered on both sides with a eggshell white paperboard. Excellent for printing and interior displays and a bit more rigid than Foamcore. Magnets: A 30 mil material with a white matte finish, readily accepts all types of pressure sensitive vinyls and silk screening. MDO Board: Plywood material covered in both sides with a very smooth UV-cured, urethane-acrylic coating, great for exterior applications and large temporary signage. Nu-Alum: A pre-finished sign panel made of thick plywood with a smooth white .013 aluminum face attached. Made for exterior use, it readily accepts paints, inks and vinyl lettering. Paper: A substance made from wood fiber in thin sheets for writing, printing or wrapping. 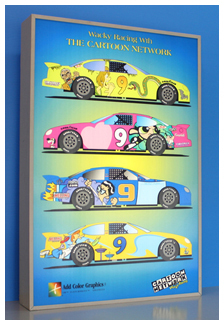 An inexpensive alternative for interior displays and for full-color print ads. Poly Metal: Similar to Alumacorr, this material is a solid polyethylene plastic core .125" thick with a smooth white baked-enamel finish, very rigid and durable, good for both exterior and interior applications. Polystyrene: A slick, shiny and durable plastic sheeting material that is a perfect background material for printing, vinyl application and a number of interior and exterior uses throughout the industry. PVC: Poly Vinyl Carbonate material most commonly used for interior plumbing applications. Very lightweight and durable, available in a variety of colors and thicknesses, as well as in shapes and flat sheets. Redwood: Extremely hard and durable wood often used for long-lasting exterior sandblasted displays. Sign Foam: Man-made material used to replace cost-prohibitive Redwood for sandblasted displays. Static Cling: Transparent material which may be printed to that will stick to clean glass surfaces. Steel: A very durable hard and strong alloy consisting principally of iron and carbon. Available in sheets, forms, angles, this is the same material used to manufacture automobiles. Vinyl: A paper-thin adhesive-backed material used to cut out letters, numbers and company logos for a variety of applications from Corex to vehicles. Available in a rainbow of colors and textures for a wide spectrum of uses. A.D.A./Regulatory: This refers to signage that falls under the Federal guidelines of the Americans With Disabilities Act, which makes use of relief lettering and Braille symbols for those without sight. A-Frame/Sandwich Board: A moveable sign which is not attached or secured to the ground and is supported by its own frame, most often a cross-sectional A shape. Aluminum Break-back Panels: Aluminum sheeting that has been bent back to create a three-dimensional look which adds stability to the finished product. Architectural: The most expensive and elaborate of all signage, created to the exact specifications of the designer. Often constructed from a combination of aluminum sheeting, angles and extrusions, capable of being internally illuminated and manufactured to appear to be a part of the original structure. Backlit: Internally illuminated signage with translucent acrylic or laser-cut aluminum faces. Banner: A popular and durable waterproof cloth-like display device coated with a white or colored background (similar to a shiny canvas) which provides multiple applications and uses. May be lettered with vinyl and re-used for temporary or special signage, may be printed with a Flatbed Printer (near photo-quality) and available in a variety of sizes. Mounting options include grommets, Velcro, pole pockets or wall-mounting and banners may even be sewn for greater strength and durability. Billboard: Large format outdoor advertisement made for easy viewing and reading at distances, often illuminated for night visibility. 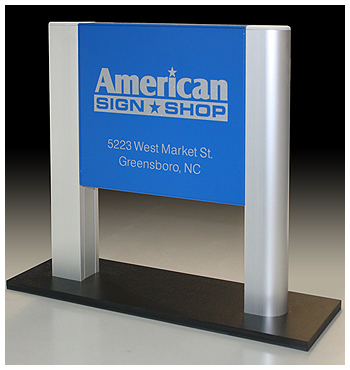 Box Sign: Aluminum or steel fabricated frame and body with or without internal illumination designed to display acrylic, aluminum or three-dimensional plastic sign faces. Channel Letters: Aluminum-walled formed letters mounted on a self-contained raceway with acrylic faces internally lit by neon tubes. Uses include interior and exterior applications and may be painted to match existing surroundings. Cut Vinyl: An adhesive-backed sheet material which may be cut into letters, shapes and logos which may be applied directly to many substrates. Available in thousands of colors and a variety of grades, some which are warranted to last as long as 9 years. Decal: The art or process of transferring pictures and images from specially prepared paper to metal, glass and other substrates. Dimensional Letters: Cast, formed, milled or machined plastic, wood, composite material or metal three-dimensional letters mounted mechanically to wall or sign surfaces. Directory: A multiple-entry signage system most commonly used to identify businesses in multi-tenant locations. Often lists all tenants and their locations and may include a map or floor plan to help customers locate. Ideal applications allow for easy change of tenant information. Door Sign: Vinyl lettering and/or logo applied directly to the door surface (metal or glass); a plastic or metal panel printed (or with vinyl lettering, etc.) used to identify the occupant or business as well as the business details (such as operating hours and emergency phone numbers). Flag: A piece of cloth or similar durable material used as the symbol for a nation, a government, or a corporation; also a great method of attracting attention when used as decoration. Flatbed Print: Permanent full-color printing onto vinyl, Foamcore, Alumacorr, Coroplast, MDO plywood, poster paper or banner material in resolutions up to near-photo quality. Job Site: A temporary sign, often made of plywood and posts, used to indicate the people responsible for the construction of a structure, as well as to advertise the coming tenants before the completion of the building. License Plate: Standard 6" x 12" metal or plastic sign used for advertisement or personalization of motor vehicles. Magnetic: Temporary or removable signage with custom graphics applied to a magnetic sheet which will stick to most ferrous metal surfaces, such as an automobile or truck. Marquee Board: A sign panel with track bar installed to provide support for removable letters, for applications which require constant change in the customer's messages, such as restaurant menus and church or school schedules or announcements. Also known as a readerboard. Menu Board: Signage that allows easy changes to items, prices and lines of text, often associated with the restaurant and drive-thru indrustries. 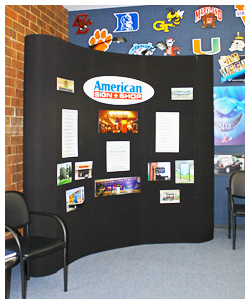 Monument Sign: A large permanent sign or display built or placed to commemorate a person, event or a company. Mural: A large graphic display or painting permanently affixed to a wall. Pan Face: A molded, plastic sign face with a three-dimensional shape. Color is typically applied to the inside of the face with paint, and the face is often illuminated internally. Poster: An advertising placard or bill for posting in a public place. Real Estate Rider: Aluminum or Coroplast sign panels mechanically fastened above or below the main display on a Real Estate Sign. Often used for contact information and for details about merchandise or property for sale. Real Estate Sign: Aluminum or Coroplast sign panels mechanically fastened to a sturdy steel frame which allows easy display for most real estate or sales applications. Industry standard sizes include the customary 18" X 24" or 24" X 36" panels with the customer's message either printed or installed in cut vinyl. 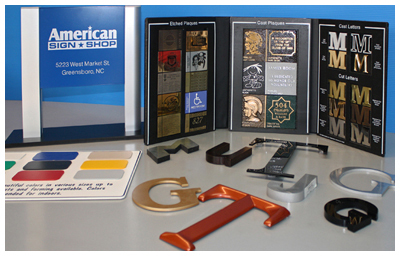 A versatile workhorse of the signage industry, more shapes and sizes are being made available every year, including diamond shapes and a variety of add-ons which may be fastened to the original sign. Sandblasted: Sign foam, Redwood or white cedar with lettering, borders and logos in relief. Capable of being painted a variety of colors and combinations, often used for large businesses and housing complexes for a classy and expensive look. 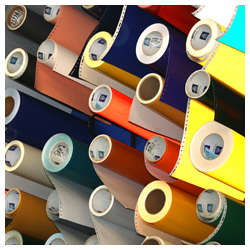 Screen Print: Permanent multi-color or single-color printing process which requires a separate screen pattern for each color used in the application. Static Cling: Removable, transparent, non-adhesive material which may be printed on stuck to clean glass surfaces. Temporary Sign: Any sign not intended for permanent display or installation, often related to grand openings, special events, and political purposes. May be constructed of virtually any material, but are most often in the form of banners and real estate type signs. Vehicle Vinyl: A thin adhesive-backed material used to cut out letters, numbers and company logos and applied directly to trucks, vans, trailers, cars, etc. Vehicle Wrap: Printed adhesive-backed material applied directly to trucks, vans, trailers, cars, etc. Print may contain photographs and and other graphics desired, and may be used for small sections of the vehicle, as well as covering the entire vehicle with stunning results. Vinyl Banner: A durable cloth-like material bonded with vinyl for long-lasting wear and colorfastness, available in a variety of colors for interior and exterior use. Most often mounted by use of grommets in combination with rope, bungee cords or mechanical fasteners. A9 Vinyl: Avery's highest rated longest-lasting and glossiest cast vinyl, offering up to 9 years of durability. A6 Vinyl: Rated for 6 year durability, often used for non-wrap and non-printed vehicle graphics (American Sign Shop suggests Avery brand vinyls for most non-printing applications and Oracal brand vinyls for printed applications). A4 Vinyl: Rated for 4 year durability but not recommended (cost difference from A6 is minimal). Border: Decorative rule or design which surrounds or frames a design. Coverage: Percentage of material to which ink or vinyl is applied. CMYK: Also known as Four Color Process, it is a standard printers abbreviation for Cyan, Magenta, Yellow, and Key (Black). In offset printing, virtually all colors can be created by combining these four colors. Four Color Process: Standard printing process based on the use of four base colors (cyan, magenta, yellow, and black) to create virtually all colors. Also CMYK. lso useful for cutting sandblast masking materials and for drawing mounting patterns for installation purposes. Grommet: A self-piercing two-piece nickel interlocking pieces that are forced together mechanically to create tie-downs for banners. Ink Jet: Large format solvent printer which may offer up to near-photo quality for posters and vinyl applications. Laminate: A thin layer of transparent material applied directly over printed materials to protect the images from wear and UV exposure (fading). Logo: A graphical icon which often depicts a company's name, and possibly combining text, symbols, and illustrations. Logos are used to distinguish one company from another. They are typically registered as trademarks and are protected by law from infringement. Layout: A finished digital file or hand-drawn artwork detailing the specific design, dimensions, colors, materials, etc. of the project. Pantone Matching System: An industry-standard method for creating hundreds of spot colors with specific formulas which can be duplicated and matched time after time. Pleasing Color: Color or colors that the customer considers satisfactory although it may not precisely match a specified spot color or original sample. PMS Color: Refers to the Pantone Matching System, an industry-standard method for creating hundreds of spot colors. Pole Pocket: Sewn or mechanically fastened banner material loop designed to hold banners around poles or standards. Price Break: A quantity at which the unit cost of the materials or finished product drops based on volume discount. Raceway: An electrical enclosure attached to the side of a building for the purposes of mounting a sign and providing power to the sign. Raster Files: A bitmap image composed of dots or pixels, in which the quality of the image depends on the bit depth and resolution of the file (photographs are a prime example of a raster image). Raster images have limited resizability and should be created at their desired finished size. Reverse: Type or graphic which is reproduced by printing or applying color around the outline of the image, and the image itself allows the background color to come through. Also known as "knockout". Resolution: The sharpness, clarity, or detail of a particular image, often measured in dots-per-inch (DPI) or points-per-inch (PPI). RGB: Abbreviation for Red, Green, and Blue, an additive color process often used with computer and video screens. Spot Color: One solid color used in an application, either alone or in combination with other spot colors to create simple graphics. Swatch: Small color samples of various materials, substrates, and inks to aid in the selection of materials. Thumbnails: Initial concept or idea for a project, sketched or drawn on paper or computer-generated to give direction to the final, finished product. Vector Files: An image which is composed of separate shapes built with line segments, polygons and text groups, allowing the possibility to independently change any element of the picture, as well as providing infinite resizing options with no loss in quality. Vinyl Plotter/Cutter: A computer peripheral device which uses vector artwork files to precisely cut desired shapes and designs in vinyl for application to signs, vehicles, etc. Similar to a tradition ink plotter, but the ink pen is replaced with a very sharp knife. Waste: Any material that is consumed during the production of a job but which is unusable, i.e. material that is trimmed or removed from a the finished piece and disposed of. Wind Slit: Semi-circular cuts made in outdoor banners to help resist the effects of wind and weather by allowing air to pass through the banner.